When Ron purchased the car it had been converted to right hand drive. Ron told Bud, it would cost approximately $15,000 U.S. dollars to have the car converted over to Right Hand Drive. Something that's mandated by the Australian Govt. In other words, it's against the law to operate a Left Hand Drive car unless under certain circumstances (parades and such). 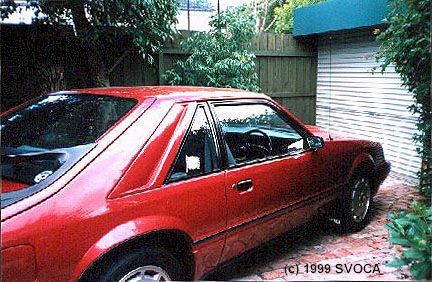 With the cost of converting a SVO to meet Australia standards that could explain why there are only 2 SVOs in Australia. The entire dash, dashpad, and cluster insert are all custom made. 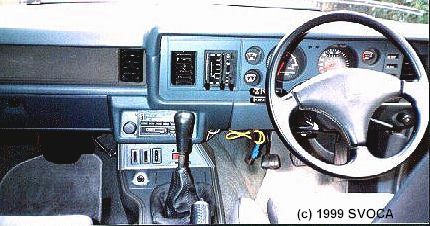 Most everything under the dash and firewall had to 'modified' to accept the steering, brakes (notice the master cyl. swapped sides with the A/C), etc... The quality of workanship is simply amazing. Ron bought the car for open track use and has recently (in the past month) had a lot of work done to prepare it for it's race track debut in June. They include a 6 point roll cage, racing harnesses, modified gear shift, modified brake - clutch - accelerator pedals, improved gauges, improved exhaust system, and the usual service work. No mods to the engine as of yet, with the exception of a E6 manifold due to the original having to be replaced from a crack. 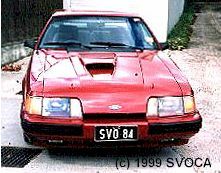 Hopefully, Ron will send us some pics of his SVO in action on the track! Ron was kind enough to update us on the progress of his SVO. Ron is in the process of de-bugging the car for the upcoming Dutton Grand Prix Rally. The Dutton Grand Prix Rally starts in Sheppardon, Saturday, March 4, 2000 and ends in Melbourne on Wednesday, March 8, 2000, the eve of the Qantas Australian Grand Prix activities. It seems that during testing Ron was having problems with the dipstick blowing out. 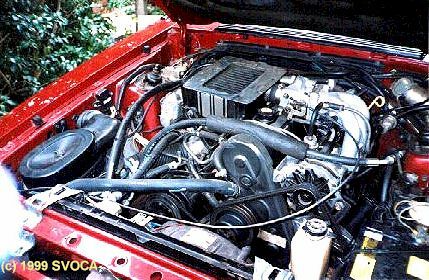 Ron's mechanic using Aussie ingenuity ran a hose from the rocker cover breather to the oil separator and then from the oil separator to the intake manifold. Ron reports that after 40 laps around Calder Park Race Circuit the car is doing well except for burning the brakes. Since the testing session Ron has installed new front rotors, new brake hoses and special race pads with different compounds for the inner and outer. Ron stated he is ready to name his SVO the "Mustang SVO Money Pit"
The SVO is now having it's "war paint" applied at Sign*A*Rama. Sponsors purchased space on the SVO to raise money for the charity called "KidsHelpLine" of which Ron is a director. Ron says he will send us pictures of the SVO when it is completed. Ron went on to say the only yesterday he had a problem when the car would not start. Of course after checking the usual things, the mechanic was called in. The mechanic changed the starter and solenoid and the same problem. The SVO was then towed to the workshop and then it started. SVO then went on a trip to the auto electric shop and found nothing obvious other than some poor wiring around the alternator. 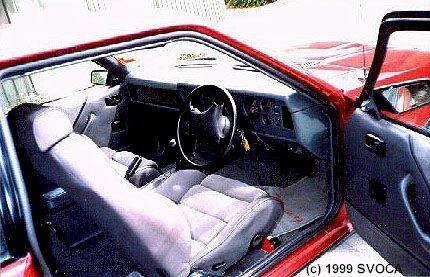 Note the custom built dash panel.